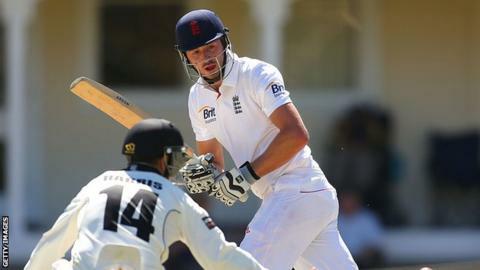 James Vince hit an unbeaten 152 as England Lions meandered to a draw in the second unofficial "Test" with South Africa A, as the series finished 0-0. The tourists began the final day in Bloemfontein on 212-4, only 51 ahead. But Hampshire batsman Vince - 61 not out overnight after adding 115 with skipper Jonathan Trott - batted through the day, hitting 22 fours and a six. He added an unbroken 72 with Durham's Mark Wood (44 not out) before a draw was agreed with the Lions on 402-7. It completes a successful series for right-hander Vince, who made 78 in the first match in which he shared another fruitful stand with double centurion Trott. However, some of the other batsmen will rue missed opportunities, such as Sam Robson - attempting to cling on to his place as Alastair Cook's Test opening partner - who made five and nought in this game. The Lions will have been disappointed to be bowled out for only 260 on day one, though they were indebted to good knocks by Yorkshire trio Adam Lyth (65), Jonny Bairstow (47) and Adil Rashid (68). The tourists then toiled on day two as Theunis de Bruyn (161) and Temba Bavuma (102) added 210 before the latter fell to Vince's part-time medium pace. Pace duo Boyd Rankin (4-78) and Liam Plunkett (3-75) were the leading bowlers as South Africa A were eventually bowled out for 421 in 110 overs. With the first-class fixtures completed, Trott now heads home while the Lions stay on for five one-day matches.